We quite like to cycle, although I prefer slow and flat while F prefers fast and hilly/off-road. That does make it a little challenging for us to go cycling together, especially now E is part of the family. 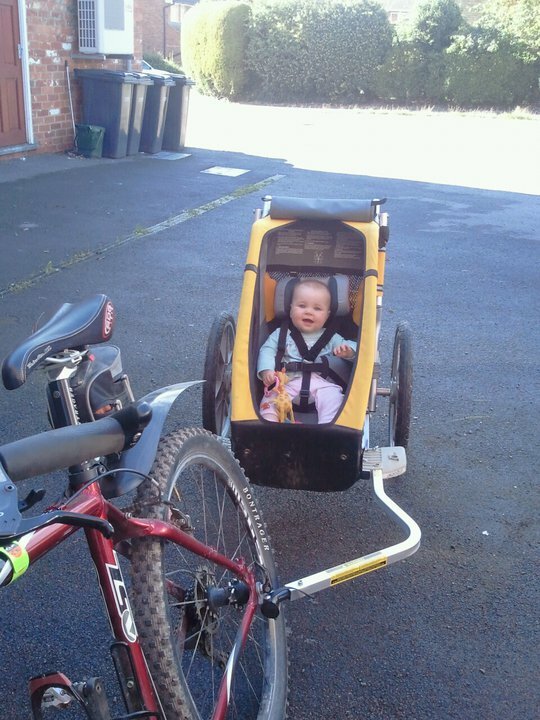 There are of course loads of different ways to take a baby or small child out with you on the bikes and we weighed up the different options: trailer, rear bike seat or front bike seat. We decided that a trailer suited our needs the best and a friend of ours happened to have a bike trailer that she was no longer using. We took it for a short test run on Saturday and E really enjoyed herself! The trailer is made by a Canadian company called Chariot Carriers and in our opinion, they are the best manufacturers of bike trailers. Unfortunately they have a price tag to match so when baby number two comes along, cycling may not be so easy - but we'll cross that bridge when we come to it. They really are pretty fabulous and you can buy conversion kits to use the trailer while cross-country skiing, hiking, jogging or just walking round town. Perfect! It's very easy to hook the Chariot up to the bike and I felt that I would then be able to keep up with F F should do all the hard work, so that's his bike in the picture. He still managed to pull away from me - how did he get so fit?? We just did a very short trip to see Nanny and Grampy on Saturday, then went for a longer ride on Sunday. F really seemed to cope well with having the Chariot on the back of his bike, taking the corners slow and wide and not getting too close to the curb. I didn't really like going along the main road with cars whizzing past us at 60mph but all was fine and E kept smiling.